Transparency Market Research (TMR) has predicted the global actuator market to steadily expand between 2017 and 2025. Recent advances upgrading technologies used in the automotive sector will offer impressive growth opportunities to the market. 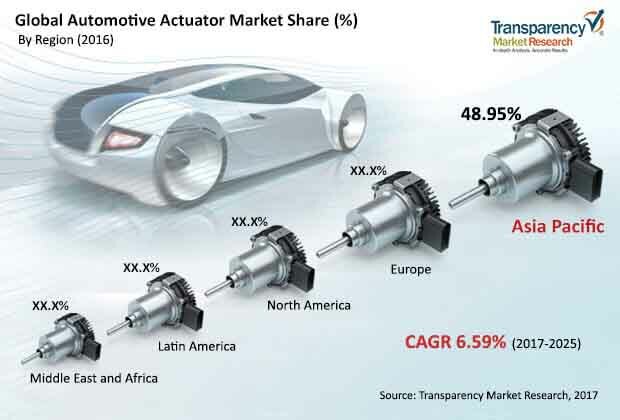 This, coupled with the increasing production of vehicles, will buoy growth for the global actuator market, finds TMR in a new study. The rising demand for automatic features in vehicles has kept the market players on their toes. With their focus on consolidating market shares, the leading names in the global actuators market are looking to expand their product portfolio. Besides this, several among them are engaging in strategic alliances with other prominent enterprises to gain a stronghold in the global actuator market. In its study TMR has profiled companies such as Cebi International S.A., HUSCO International, Kiekert AG, Actus Manufacturing, Inc., Robert Bosch GmbH, and others. It studies in detail various strategies adopted by these companies to gain a competitive edge in the global actuator market. According to TMR, the market will exhibit a CAGR of over 7% between 2017 and 2025 in terms of volume. The market is likely to be facilitated by the rising demand for vehicles with automatic features. Against this backdrop, the market has gained immensely from the advent and the subsequent popularity of electric vehicles. Regionally, Asia Pacific emerged dominant in the global actuator market on account of the presence of the several leading companies in the region. The expanding automotive industries in India, China, and Japan are forecast to fuel growth opportunities for the market in Asia Pacific. Besides this, the availability of cheap labors, declining import duties, and favorable government initiatives are expected to create lucrative prospects for the actuators market. Automakers are running their business amidst cut-throat competition. At a time when consumers are spoilt with choices, several manufacturers are including automatic features to differentiate their products. This in turn gives scope for growth to the global actuator market. In the coming years the market is expected to gain from the rising use of electronic components in vehicles. Given the scenario, the rising disposable income of consumers will bode well for the actuators market. On the downside, the presence of certain stringent regulations is restraining the market to an extent. For instance, various governments strictly observe a few safety norms for vehicles that are projected to fuel the demand for actuators. Be it as it may, some of the strict guidelines have compelled automakers to include systems such as VVTs, turbochargers, and active grill shutters in their vehicles. Actuators are integral to these systems hence such regulations are expected to sway demand in favor of the global actuator market. In the coming years, the market is expected to witness rising demand from the HVAC, which also held dominance in the market based on application. The rising demand from this segment is forecast to bode well for the market. Furthermore, the increasing adoption of headlamps is expected to bolster sales prospects.